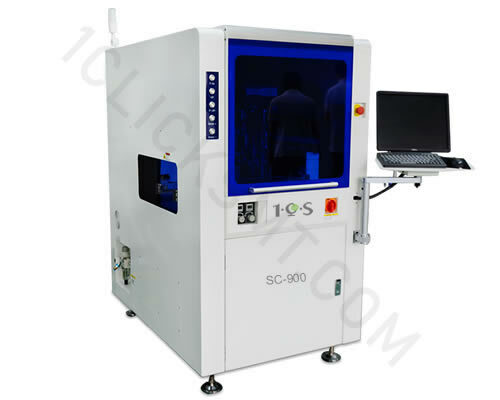 High Performance 4 Axis Selective Coating Machine SC-900, Economical 4 Axis Selective Coating Machine SC-445, Economical 3 Axis Selective Coating Macine SC-345, Economical Whole Board Coating Machine SP-100 ,conformal coating system . 1. Machine adopt high strength welding frame , X/Y/Z/R axis adopt Panasonic servo motor and ball screw to ensure high speed and stable running. 2. 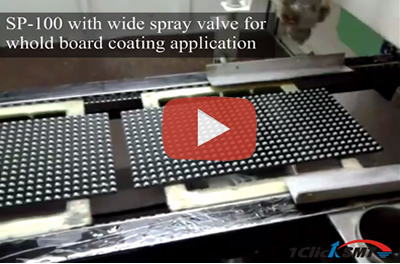 2 tiltable valves with ±170 degree rotation can do side coating for component. 3. A variety of high precision valves can meet different coating requirements. 4. 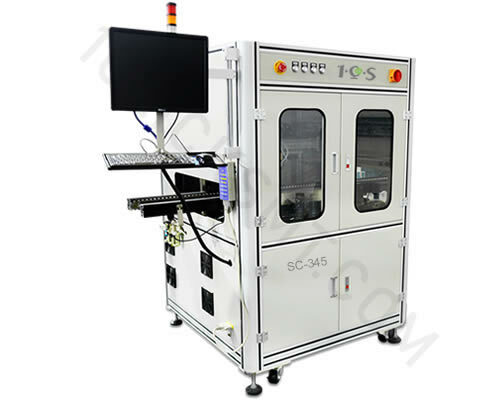 CCD system can be used for programming and mark recognition. 5. Glue weighing system can avoid missing coating. 6. Barcode reading system which can automatically call program according to barcode for double side coating line. 7. Professional coating software easily meet various requirement of coating prcoess. 8. Capable to provide customized whole coating line. 1. 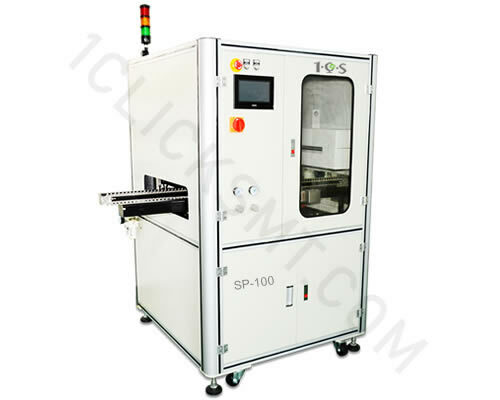 Machine adopt high strength welding frame , X/Y/Z/R axis adopt Panasonic servo motor and ball screw to ensure high speed and accurate running. High strength welding frame with high performance Panasonic servo motor and it's driving system which can reach ±0.05 mm repeatibility to ensure accurate and stable coating process . 2. 2 tiltable valves with ±170 degree rotation can do side coating for component. 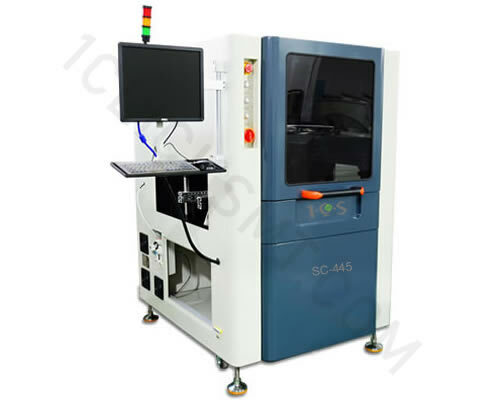 Sometimes there are coating area blocked by components or under components where valve can not reach.SC-445 coating system is equipped with R axis which can rotate ±170 degree , the rotable and tiltable valve can perfectly solve this problem to ensure no dead angle coating process. 3. 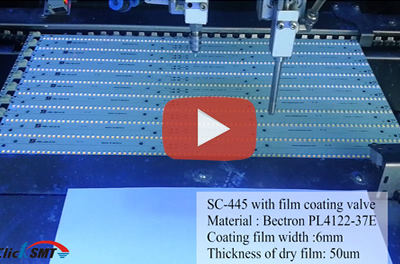 X/Y/Z/R axis adopt Panasonic servo motor and ball screw to ensure accurate coating process . All the X/Y/Z/R axis adopt high performance Panasonic servo motor and it's driving system which can reach ±0.05 mm repeatibility to ensure accurate and stable coating process . 1. High strength welding frame , X/Y/Z/R axis adopt Panasonic servo motor and ball screw. 2. Tiltable narrow spray valve and needle valve with ±170 degree rotation. 3. Equipped with 3 high precision valves : narrow spray valve ,needle valve,wide spray valve. 4. CCD system for programming and mark recognition. 6. Barcode reading system for automatically call program. 7. Professional coating software based on windows 7 OS. 8. Standard equipped with 10L material tank and 2L cleaning tank. 1. Aluminum frame , X/Y/Z axis with step motor and synchronous belt. 2. Equipped with 2 high precision valves : narrow spray valve ,needle valve,wide spray valve. 3. Glue weighing system is optional. 4. Professional coating software based on windows 7 OS. 5. Standard equipped with 10L material tank and 2L cleaning tank. 1. Aluminum frame , single Y axis with step motor and synchronous belt. 2. Equipped with wide spray valve. 3. PLC with touch screen control. 4. Standard equipped with 10L material tank and 2L cleaning tank.